Every minute, the equivalent of one garbage truck of plastic waste enters our oceans—a total of 8 million metric tons a year. This plastic waste litters the seafloor and floats on the surface in vast plastic patches, poisoning seabirds and other marine life. By the year 2050, one estimate suggests there will be more plastic than fish in the world’s oceans. 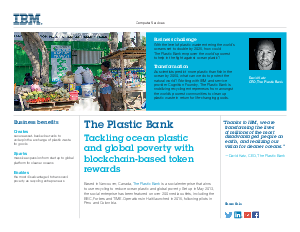 Founded in May 2013, social enterprise The Plastic Bank aims to tackle ocean pollution head-on.